EnerNOC, Chai Energy, OhmConnect, WeatherBug, AMS win bids in second round of country’s biggest DERs-as-capacity experiment. California’s groundbreaking test of distributed energy resources (DERs) as aggregated grid assets continues -- and this time, the rewards and the responsibilities are even greater. 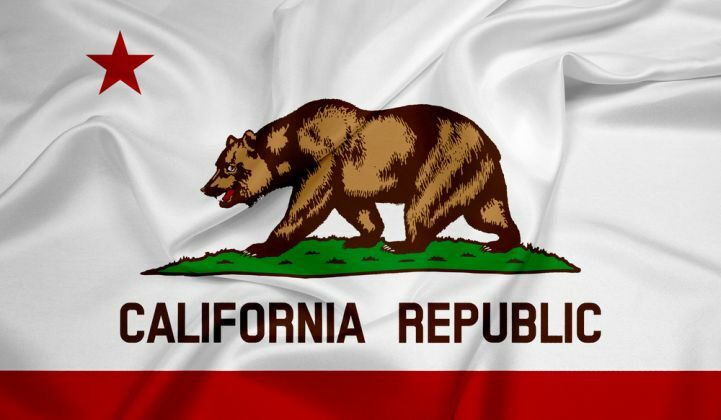 Late last week, California’s big three investor-owned utilities announced the winners of 81.6 megawatts' worth of contracts for the Demand Response Auction Mechanism, or DRAM. 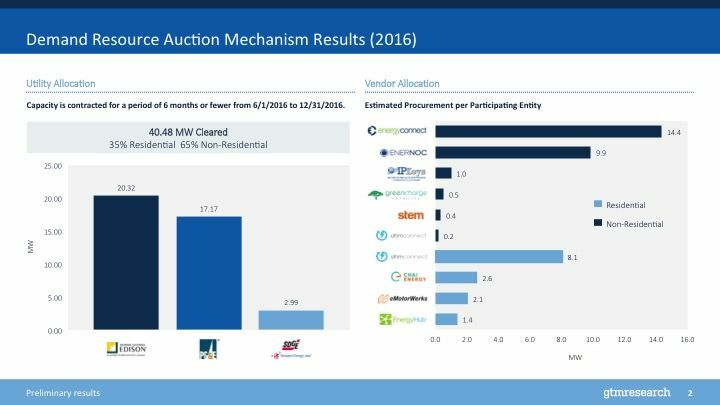 It's the second auction for a multiyear project that represents one of the biggest tests in the country of a fundamental premise of the grid edge -- that DERs, like battery-backed solar PV, energy storage, plug-in electric vehicles, and smart thermostats and other energy-controlling devices, can work in concert to solve problems at the utility scale. We’ve been covering DRAM since its inception as a California Public Utilities Commission-mandated pilot project, and examined it in depth in a GTM Squared piece last autumn. We also got into some details in January, after utilities Pacific Gas & Electric, Southern California Edison and San Diego Gas & Electric named the winners of bids to provide a combined 40-odd megawatts of aggregated grid resources for the 2016 year. The winners of that first round included demand response companies EnerNOC, Johnson Controls’ EnergyConnect and IPKeys/Power Partners, behind-the-meter batteries from Green Charge Networks and Stem, residential load control from Alarm.com’s EnergyHub, OhmConnect and Chai Energy, and plug-in EVs from startup eMotorWerks. The winners announced this week include some of the same names as last year, but in different proportions, noted GTM Research analyst Elta Kolo. 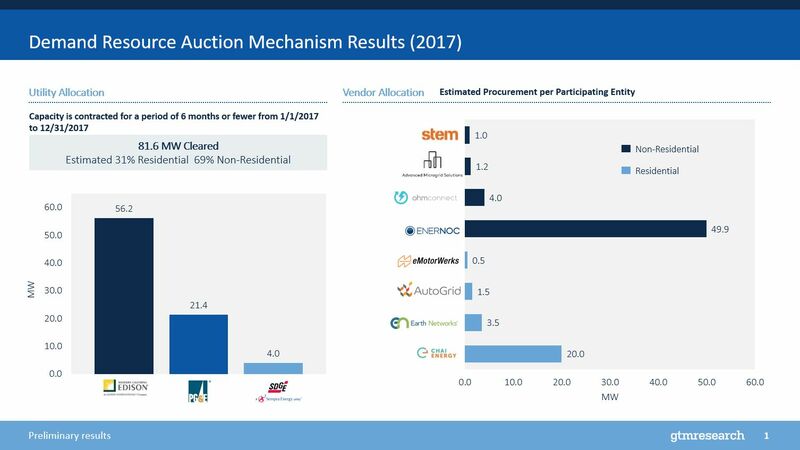 EnerNOC, in particular, took a big chunk of the new round, with nearly 50 megawatts of commercial capacity, and Chai Energy claimed 20 megawatts of mostly residential capacity, according to GTM's analysis of utility filings. Stem, Green Charge, OhmConnect and eMotorWerks also landed additional contracts from this latest auction, ranging from 500 kilowatts to 4 megawatts apiece. A few new companies also landed contracts in the latest auction, including some well-known names in the California DER market. On the commercial buildings side of things, behind-the-meter grid project developer Advanced Microgrid Solutions landed 1.2 megawatts, and demand response software and analytics startup AutoGrid won 1.5 megawatts. On the residential front, home energy management provider Earth Networks and its WeatherBug service won its bid to provide 3.5 megawatts. According to the DRAM rules, these companies have all pledged their own confidential, auction-clearing price to provide a certain amount of “kilowatt-months” of grid capacity, for up to four hours per day during the state’s times of peak grid demand. That means two things -- first, that they’ll deliver that load reduction to their utility partners for use in meeting their resource adequacy requirements for future years; and second, that for the coming summer peak season, they’ll submit “must-offer” bids into the markets of state grid operator CAISO. Last year’s bids were for the 2016 delivery year, which is just getting underway this August. This summer’s DRAM participants will be making their offers into CAISO’s next-day energy markets, in increments of at least 100 kilowatts, under its Proxy Demand Resource (PDR) program. That’s the same structure that’s been used for previous distributed, aggregated resource pilots over the past few years, like the Intermittent Renewable Management Pilot and the Supply Side Pilot. This most recent round will require participants to work with a slightly more sophisticated set of CAISO markets, starting in summer 2017. First, they’ll be able to participate in real-time, as well as day-ahead, energy markets under PDR, in increments of at least 100 kilowatts. Second, they’ll be able to bid increments of at least 500 kilowatts into the real-time Reliability Demand Response Resource program. These changes are part of CAISO’s ongoing changes to bring “flexible capacity” into play to meet steeper troughs and ramps in the state’s energy supply. The best-known example of this is the “duck curve” pattern, driven by the increasing amount of solar PV energy that drives down demand in midday, then fades away in the late afternoon. The CPUC wants the DRAM program to serve as a model for how distributed energy can play a role alongside large-scale, centralized generation and load controls to meet these future challenges. But because it’s a first-time effort, DRAM is also gauging whether these resources can reliably meet the grid’s needs. Apparently there’s no shortage of DRAM capacity to be bought. Each of the state’s big three utilities hit their minimum targets for 2017, with SCE procuring 52.6 megawatts, PG&E 21.4 megawatts, and SDG&E, which has smaller targets because it serves a smaller customer base, nearly 4 megawatts. As for how much each vendor is charging for the kilowatt-months it has pledged, the prices would appear to not be breaking the bank so far. Each utility has been able to contract for what it needs within its respective budgets, which for the most recent procurement was $12 million apiece for SCE and PG&E, and $3 million for SDG&E. “[W]hile the 2017 offers have been more competitive in terms of pricing than 2016 offers, possibly in response to the opportunity for longer contract terms and increased Seller confidence in the Pilot viability, it is still unknown whether the Sellers can fully deliver the products at the contracted prices. Hence the 2017 Pilot offers should not be seen as representative of stabilized market costs should DRAM evolve into a mature and long-term approach to aggregated DR procurement." The following are estimates from GTM Research of the DRAM program's awards to date, by utility and vendor. Find the full report, covering all major aggregation initiatives across regional markets, here.